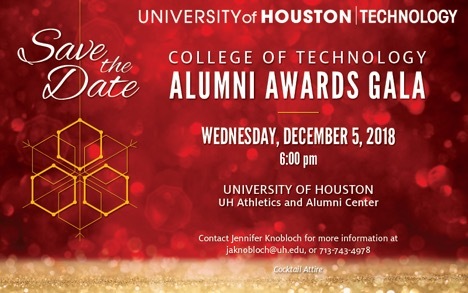 The College of Technology will celebrate its alumni for their outstanding service and professional accomplishments at the Technology Alumni Awards Gala on December 5, 2018. This event will recognize several individuals who have been influential leaders in their communities. A reception and dinner will be held along with an awards presentation for four categories: Distinguished Alumni, Rising Star, Volunteer Service, Entrepreneur, and Outstanding Technology Faculty. “By showing the commitment, trust, integrity, and fun that comes from being involved with the Technology Alumni Association, the culture of the College of Technology and relationships with alumni will become stronger,” said, David Garza, ’17, TAA president. “Involvement with the TAA offers opportunities for student and alumni interaction through mentoring, professional development, and career exploration. Providing an environment where students can connect, participate, and be part of a community, reinforces the University of Houston’s traditions and values,” he said. Registration for the Gala will be available online. Contact jaknobloch@.uh.edu or call 713-743-4978.